There are times when football is an easy game. Motherwell blew Livingston aside on Saturday with a breathless opening salvo that had the contest finished in the first quarter. Confidence is a great giver. 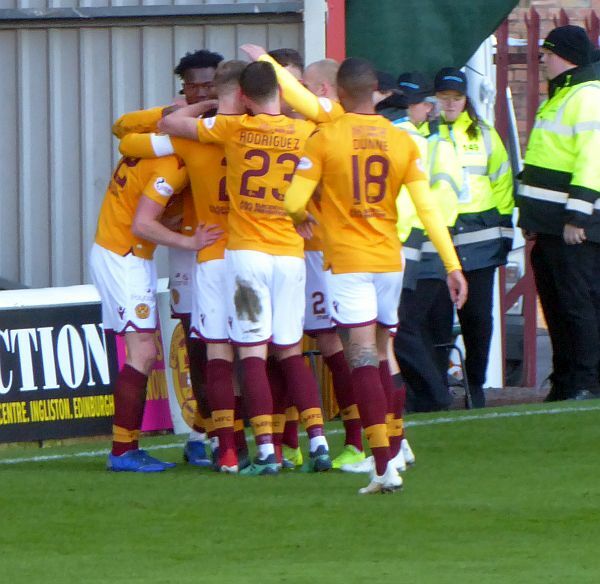 With three league wins already behind them Motherwell took to the field not only with belief but with determination. It was a fine team effort but there was particular pleasure in the home stands that we had a core of home grown boys in the mix. Who's that in the middle? Allan Campbell, David Turnbull and Jake Hastie (and the injured Chris Cadden) all played in the team that lifted the SFA Youth Cup in April 2016. The structure at the club that enables progression to the first team has succeeded and all those who make a contribution should be lifted by their labours. Turnbull’s accurate free kick found the rising Hastie to set us on the way. Campbell delivered an accurate ball through the centre to give Curtis Main his chance before Hastie topped off his great day with a sixty yard dash for goal number three. It was no surprise had he had a standing ovation when he came off the park in the 81st minute. A few weeks ago the league table made for uncomfortable reading. After December defeats to St Mirren and Kilmarnock we were too close to the bottom three. But four league wins have given us a fifteen point lead over our Lanarkshire rivals – a huge margin. Stephen Robinson can now start early planning for next season. The threat from behind has all but vanished and he can concentrate on the long view.